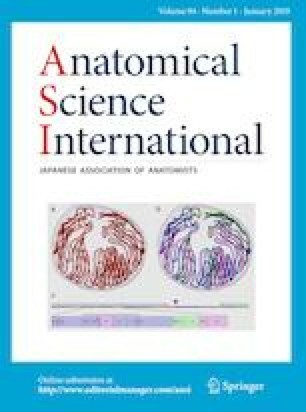 Using an immunocytochemical technique, we have studied the distribution of fibers and cell bodies containing somatostatin-28 (1-12) [SOM-28 (1-12)], calcitonin gene-related peptide (CGRP), and substance P (SP) in the brainstem of Saimiri sciureus. The distribution of the peptidergic cell bodies was very restricted: perikarya containing SOM-28 (1-12) were only observed in the substantia grisea centralis, while no immunoreactive cell bodies containing CGRP or SP were visualized. Fibers containing SOM-28 (1-12), CGRP, or SP were widely distributed in the brainstem: immunoreactive fibers containing SOM-28 (1-12) showed the most widespread distribution and were the most abundant. The distribution of SOM-28 (1-12)-, CGRP- or SP-immunoreactive fibers was very similar. Colocalization of immunoreactive fibers containing SOM-28 (1-12), CGRP or SP was observed in many brainstem nuclei. A neuroanatomical relationship between CGRP- and SP-immunoreactive fibers was observed, although this relationship was less marked for SOM-28 (1-12) and SP and lower still for SOM-28 (1-12) and CGRP. The widespread distribution of the peptidergic fibers suggests that the studied neuropeptides are involved in many physiological actions. This work has been supported by the Universidad de Santander UDES, Bucaramanga (Colombia). The authors wish to thank Professor Gérard Tramu (Université de Bordeaux I, France) for the gift of primary antibodies, and the language service of the Universidad de Santander UDES (Colombia) for supervising the English text. This work is dedicated to Professor Julio Villalobos (Universidad del Valle, Cali, Colombia).